In this previous post I talked about the Whigs and Democrats policy stances in the early 19th century. I showed that these two parties differed on a wide range of issues. Now I hope to describe their coalitions of support and show how they were linked to the policy views. In other words who supported which party in the all male and overwhelmingly white electorate of the day? The Whigs were the party that supported government subsidy for economic development- the agricultural industrial revolutions if you will. Thus those who benefited most from them were much more likely to support Whigs. Those who were wary and even hostile to them supported Democrats. What this translated to on the ground was that areas and people dependent on commercial agriculture (i.e. farming done to sell on the market) supported the Whigs. . Similarly urban areas based on commerce tended to be strongly Whig. Subsistence farmers by contrast voted much more Democratic. Moreover there is a lot of evidence these divisions were created by the clashes on economic policy. The Jacksonian and anti-Jacksonian predecessors to the two parties had had much less of such economic based divisions. As economic policy divisions became clearer and clearer in the late 1830’s so did the divisions in the electorate. This may help explain incidentally the difficulty historians have had in understanding these divisions. The superficial similarity of the party system (one of these parties still exists after all) has confused them. For after all rural backwaters are fairly politically marginal today! But in the rural society of the 1840’s they provided the basis for a winning electoral coalition. There was also a class division again based on attitudes to economic development. Within cities the better off were much more Whig. In the cities more marginal workers for whom the industrial revolution was less of an unadulterated blessing were less likely to vote Whig..For most of this period for example in urban Boston the Whigs won ever ward- but they did worst in the poorest ward and best in the richest. The Closer and keener you were on development the more likely you were to be a Whig-so the urban were more Whig than the rural. One should not consider the electorate of the era idiots for adopting these attitudes. The direct beneficiaries of national banking legislation were bankers and those who borrowed of them. For Subsistence farmers’ credit was a potential trap as in the third world today. Similarly when it came to economic development roads and railways were overwhelmingly used by those seeking to take goods to market. Tariffs benefited overwhelmingly urban based constituencies- while raising the prices of the few goods subsistence farmers bought. Above all in the early republic there was a pervasive wariness of the government making distinctions (“aristocracy” it was often called) between different people- as is implied in the government backing loans, building roads in one place but not anther and to some degree even in setting tariffs. Those who saw themselves as beneficiaries of such measures could swallow such scepticism and even see them as an “American System” tying them together. Those who did not would not and rose in opposition to such measures. One can prefer on principled grounds the Whig or Democratic programmes of the day or elements of both. But the voting behaviour of the electorate was perfectly rational-they were not fools. At the same time ethnic factors mattered a great deal in the North. African Americans for reasons already given voted Whigs- but so did most people of English descent. The big differences were generally ethnic and religious. Native Americans (that is people born in the United States it had a very different implication from the modern!) tined to be more Whig immigrants were consistently more Democratic. Indeed greater support among immigrants is one of the consistencies in the Democratic Party’s complex history. . People of English descent were more likely to be Whigs –other ethnic groups including Ulster Protestants were more Democratic. However one of the biggest differences of all was religious. Several of the largest denomination was part of what was widely seen as a “benevolent” empire what historians often call the “united evangelical front”. This was true most of all of the Congregationalists but also of at least large parts of every large Protestant denomination. There were for example pan Evangelical rallies, revival meetings, bible societies and the like. Though there might be minor denominational differences the greater concerns were a sense of Christian salvation through grace and religious revivals and working to transform the world in the light of their sense of Christian conscience. The members of these groups were more Whig- and were probably close to half the US population. On the other there were large groups that stood outside this front. The fastest growing (swelled by immigration) were Catholics. Certain Protestant groups though such as “Old line” (strict) Presbyterians or “high confessional” Lutherans also placed a much greater emphasis on the particular teachings of their denomination. Similarly free thinkers had problems with evangelical teaching for more obvious reasons. All these groups were much more Democratic. Again this flowed out of the State differences described previously. Issues such as restricting alcohol, increasing educational levels, expanding knowledge of the (Protestant King James) bible according to a necessarily broadly Protestant rather than “sectarian”, fighting slavery aroused the enthusiasm of the members of the united evangelical front. It aroused either indifference. Even the Whigs economic programme could be seen as an attempt to renew American society and arouse the Front’s enthusiasm and its opponent’s hostility. The degree to which this was policy rather than theology is well shown by the few exceptions to this rule of the prestigious and the orthodox voting Whig. . African Americans unsurprinsgly voted for the Whigs- the exception that proved the rule in a sense since part of moralise was their protection and opposition to slavery. However there were also certain groups which bought into all or most of the Front’s cultural and behavioural ideas whilst virulently rejecting Trinitarian Christianity-most notably Unitarians and Reform Jews. These two groups also tended to the Whigs. In Louisiana and Maryland where Catholics were the more established and "respectable" group and where many of the social issues initially mattered less at the state level they tended to be Whigs. The Whigs were very vulnerable to “social” issues (one reason why they often tried to downplay them in favour of economics with mixed electoral success). On the one hand every new wave of immigrants shrank their share of the Vote. On the other their party contained an explosive mixture of urban elites and religious crusaders, slave owners and anti slavery zealots. These problems were to bring the Whigs down. However ever even the Whig Democratic Party divisions are enough to confuse the contemporary reader on the one side stood the party of active government, Protestantism, “Law and Order” and “black rights”. On the other the party of limited government, religious pluralism, violent protest and “white rights”. One party stood for the urban, the evangelical the rich, the Anglo Saxon and the Black. Another for the rural, the Catholic, the secular, the poor the Irish and the White. The divisions were very real-and made as I hope I have shown coherent sense. But they were very different from our own. 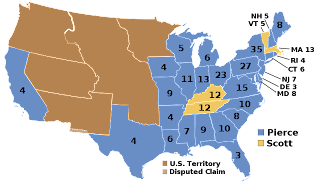 This picture is of the 1852 election-the last election the Whigs were one of the two largest parties. The Whig cndidate was Winifield Scott america's greatest living war hero, the Democratic candidate the New Hampshire Political boss and former Senator Franklin Pierece. The Whigs manged to get 44% or so of vote but were crushed by new immigrants voting in the North and the fear they were insufficiently pro slavery in the South. They are, of course, the divisions one might expect at the time. To a degree, I think US political parties bore some ressemblance to British equivalents at the time, in that religious denomination was as important as class divide in determining voting pattern. The main differences were that Toryism in the US had become a dirty word, due to it's association with Loyalism and even the quasi-Tory Federalists had suffered as being to Aristrocratic looking in a mass democracy. In England the limited electorate severely curtailed the chances for the Radicals, so bizarrely, a lot of Anti-Whig sentiment, hostility to the groups who supported the Whigs, translated instead to the Tories, whereas in the US, the reverse happened, the Democrats were Radicals, but also picked up those who opposed the Whigs for old school Tory reasons. I'm thinking of say, Lancashire, where the working folk tended to vote Tory to oppose their non-conformist, Whig inclined bosses. And in the same way, in the US, Aristocratic slave owners found themselves allied to the more 'working class' of the two parties.
. I agree that one could see the American Whig's as in a sense somewhat equivalent to British toryism of the 19th century. However only a toryism where most of the foundations of toryism had been removed. Thatis where there was no monarchy not establsihed Anglicans church (indeed not much left of even Congregationalist church Establishments), not much of an aristocracy. There was also more or less white male universal suffrage-though I think the importance of this for 19th century Tory identity can be exaggerated. It would have made the radicals more powerful though a more important difference with the "radicals" dominating. Nonetheless one can see parallels, the Evangelical Front was not an established church but sociologically had some similarities. The belief in using govt to strengthen favoured interests was common to both. IN n a sense the Whigs were closer than the democrats to a European style right of throne and altar- though the differences can be seen by the fact it was essentially a union of factory and pulpit instead! I will disagree with you outright about Lanacashire- my view is the Tory vote was chiefly a sectarian vote against Catholics and a nationalist vote against Irish (which besides anything else probably reconciled non catholic protestants to the Church Establishment) and after all the Stanley's were probably the first family of Lancashire and not liberals for most of the period and certainly not nonconformists. Harcourt-Gladstone's top lietuant was virulent when he placed down defeat in Lancashiure to "hatred of the Irish" but I think he was partially right. - I vaguely recall as such issues rose in the 1860's Lancashire got more conservative as well. I'd also deny southern slave owners were by and large "aristocratic"-they were successful bourgeois with some aristocratic tendencies-just like the elites of New England. Chattel slavery is not the same as feudalism or aristocracy. I'm sorry addtree I don't quite understand your point-please expand if you have time!